To day I again called for an investment to be made into the infrastructure in Newbridge to facilitate the building of a second bridge for the town. 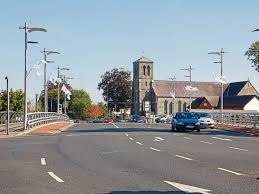 Transportation continues to be a huge issue for the town and it is to be hoped that the Urban Regeneration and Development Fund will have funding available for a second bridge in the 2019 / 2020 funding following an unsuccessful application in 2018. The aim of the URDF is to stimulate new residential and commercial development in our larger cities and towns to be supported by new services and amenities. The Government said that it was “aimed at unlocking the potential undeveloped sites in our towns and cities. Newbridge is currently experiencing a critical infrastructural blockage with only one bridge crossing the Liffey and this must be remedied. I have been raising the need for a second bridge for years and in that time, the traffic levels have increased hugely, putting further pressure on our inadequate infrastructure. Kildare commuters have been seriously impacted by the road works on the M7 and the situation in the town of Newbridge itself is deteriorating steadily. I have called on Kildare County Council to make every effort to source funding for the provision of this new bridge. A second bridge would have a tangible and positive impact on the daily lives of people living in Newbridge and this is the whole point of this funding.